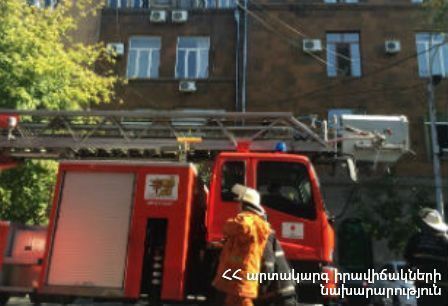 On August 11, at 14:18 an emergency call was received to "911" service that a fire had broken out in a house in Qeri street, Yerevan. 4 fire brigades from the fire and rescue squad, the emergency response group of the National Crisis Management Center of the rescue service and the duty group of the Center of Disaster Medical Treatment of MES of RA left for the scene. The fire was isolated ta 16:22 and extinguished at 17:40. The 12th house (about 100 m2), the roof of the 12th a house (about 150 m2), the roof (about 100 m2) and a piece of the wooden ceiling (about 4 m2) of the 14th house burnt. The director of the Rescue Service of the Ministry of Emergency Situations of the Republic of Armenia, r/s colonel Artak Nahapetyan was at the scene.